What are the best uses of this world? What are the pros and cons of this world? How do people sometimes misuse this category? Let’s start off with the Banking World and see how it may be a fit for you. First, if you were to deposit money into the bank you are going to have safety. Your deposits are backed by the FDIC and you will receive some sort of interest rate. Second, you will have liquidity, meaning that if you were to deposit one thousand dollars today you can withdraw the same one thousand dollars tomorrow with no penalty. Does this sound good? Do you want to put all your money in the bank? If your answer is ‘Yes’, you will not see much growth on your deposits, especially in today’s low environment. By investing in the bank, you get two out of three characteristics, safety and liquidity, but not much growth opportunity. Why you would invest here: You should have emergency money of 6 to 12 months of expenses here.. Investing in the bank would provide you with liquid funds that you could withdraw with no penalty. This world involves investing with an insurance company. Typically, these are going to be annuities. There are fixed annuities, indexed annuities and variable annuities. Here we will explore only fixed and indexed annuities. When you invest dollars into a fixed annuity, you have safety. The insurance company will give you a guaranteed interest rate on your deposit. The fixed annuity in today’s interest rate environment will be in the 3% to 4% range. So depositing the same one thousand dollars into a fixed annuity will earn you thirty to forty dollars per year in interest. An indexed annuity will tie your interest rate to some sort of index like the S&P 500. Your interest rate here depends on how well the index performs. You will not receive 100% of the gain but rather a portion of the gain. In years where the S&P 500 does well, you could earn up to 10%. When there is a negative year you will earn 0%; but you will keep your gains from prior years. If you are thinking to yourself this sounds like a really good place to invest some money, then you need to know the catch. If you see the appeal to an annuity-based investment, you need also to be aware of the non-liquidity risks. Most annuities allow only 10% per year to be withdrawn without penalty; so once you deposit funds into an annuity, they cannot be withdrawn (without penalty) for a specific period of time, typically between 5 and 10 years. Additionally, funds cannot be withdrawn before age 59 1/2 without penalty. In summary, an annuity investment provides safety and possible growth but no liquidity. This should be for money you will not need for 5 to 10 years. This is a longer-term investment and should be treated as such. If you were to invest in the Wall Street world, you will have liquidity. You can invest the same one thousand dollars as previously have access to your money at any time. Depending on how the market performs, you may get more or less than your original investment back. Wall Street World is also a longer-term investment and should be treated as such. You could make 20% in one year and lose 15% the next. However, over the long-term, you should have more growth than in either the banking or insurance world. By now you have figured out there is no safety in the Wall Street world. Why would you invest here? You will have liquidity and possible growth but no safety. Most people will invest here for their retirement needs and growth for the future. Remember the younger you are you will have time on your side to overcome the down markets. The older you are you may need to look at investments like dividends that will produce income for you. 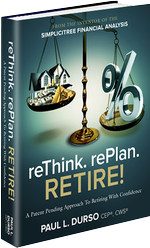 Income is the key for most retired people. If you have any questions please reach out to us and we will be happy to assist you in any way.